That which you see above, my friends, happens to be a great source of magnesium and it’s also known to improve one’s cardiovascular system. Not only does it lower your risk of developing high cholestrol and high blood pressure; it supposedly controls your blood sugar levels which in turn, lowers your risk of diabetes. I’m no nutritionist, but I know a health-food when I see one, or taste one. Besides, the internet provides a wealth of information! What’s this amazing food that I happen to be crazy about right now? Buckwheat of course. Commonly used in soba (buckwheat flour), buckwheat is also a common staple in Russia. 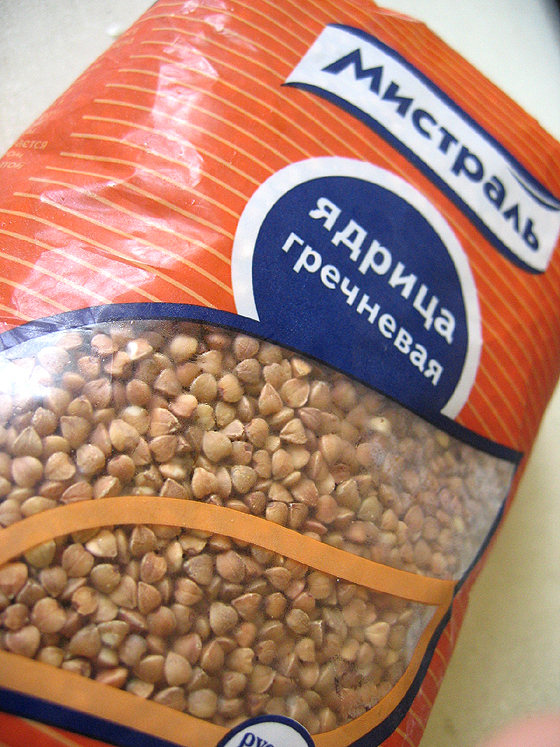 My cousin studies at the Moscow Conservatory in Russia and he bought some packs of buckwheat. I’ve never ever eaten whole buckwheat and found it quite intriguing. According to my research, I was given toasted buckwheat groats. There are various ways of cooking it. But I think the easiest way is to steam it, and the end result is known as kasha. 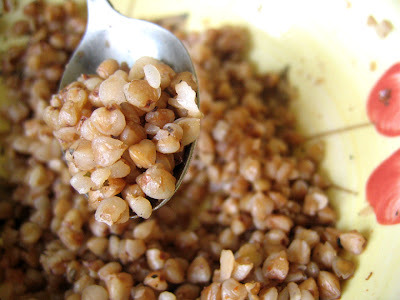 Since I was clueless as to how to cook it, I googled buckwheat and found this kasha recipe. It’s a really fool-proof dish to cook when you’re hungry and don’t want to eat something normal. Haha. okay, not that buckwheat is abnormal! It’s just really good if you are looking for something to satisfy your hunger. Yes, I was a very hungry person today. My appetite today seemed rather insatiable. Thank god for the buckwheat! Anyway I toasted the buckwheat first (even though I think it’s already toasted), before pouring it in a pot of boiling water with some oil. The recipe recommended sea-salt (which I didn’t have) and butter/olive oil. I’ve decided that I’m going to eat more whole grains and less refined stuff. I know I know, I can’t possibly be a health-nut but hey at least I’ll try my best to lead a balanced lifestyle. Afterall, we are what we eat, no? Hi Baker! I made the Choux pastry puffs because your pictures looked so tempting! My paste didn’t turn out as smooth and shiny as yours. I have posted the pictures. If you have a minute, could you drop by and take a look and maybe give a tip on where I went wrong? (I mixed the paste using a fork, not an electric blender) Thanks lots! I love buckwheat too! You are right! They are superbly fantastic! BTW, I check out your blog everyday and think it is fantastic! Well-done and keep it up! hi, do you know where can i purchase peanut butter chips for baking in Singapore? Thanks for spreading the word of buckwheat wonders! I LOVE buckwheat (well, the fact that I grew up in Russia helps). In the US you can buy it at Russian delis (oft disguised as European delis in major cities). 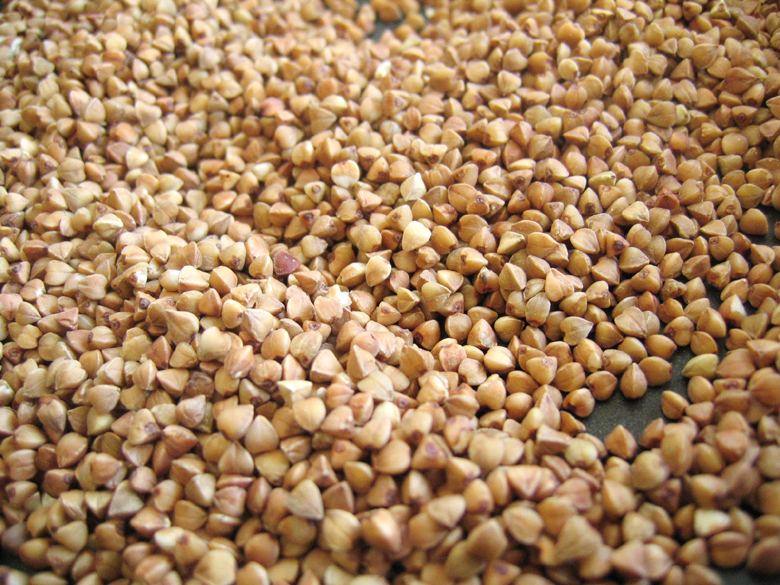 Did you know that you can make mock-pilaf with buckwheat? simcooks: hey! checked out your choux pastry puffs on your blog… it looks great! it’s okay if your paste is not smooth and shiny.. I think it depends how large the eggs are? anyway good job! Magdalene: yay! another buckwheat lover.. haha cool blog you have there. thanks for your support! Anon: hey hey. yes Jason’s Marketplace (at the basement of Raffles City Shopping Centre) has them. It’s under the baking section. hope this helps! Anon: yea, I’m glad to have finally tasted buckwheat. it’s about time! better late than never eh? mock pilaf? sounds uber cool! would love to try it out! Thanks Baker! I appreciate you taking a peek at my choux pastry puff paste. BTW, I have just tagged you for a “5 Things You Don’t Know About Me” meme. Care to spread this labor of love? Sigh…you’re making me think of New Year’s resolution #3, which was “eat more healthy”. If I am what I eat, then I am certainly a cupcake. I love its taste as well. 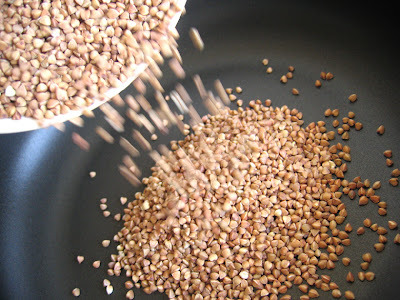 Even though I am more accustomed to bulgur in many ways, buckwheat is another grain I eat. They sell it in bulk food sections in some supermarkets here (in CA, USA) but not a very common one, for sure. Jewish folks love buckwheat although we call it kasha( and bows). I make it with carmelized onions, cook it in stock and toss it with the onions and bow tie pasta.